Knowledge is only potential power until you execute it. But what if the knowledge you have is wrong? So Knowledge is neither power nor potential power. What about our personal experience in life? Your personal experience is relative to you alone and serves no one else. Experience is a catalogue of information that your mind creates to make life convenient so that you don’t have to go through the hassle of making sense or meaning of what something is again and again. Your beliefs create your unconscious and dysfunctional reality, which is proven by your experience, always. This is the reason why two different people can experience the exact same event at the same exact time and moment, yet both can take away different and even contradicting lessons. This is one of the fundamental mistakes that majority of the coaches make. Most coaches think that because they have years of experience is what qualifies them to serve their clients. Unfortunately, your life is yours to live alone. Your lessons are for you to learn alone. A powerful coach does not project any of their own beliefs, experience or values on their client. The number one priority of a coach is to know their client. Both the dark and light side. A powerful coach knows that their clients are already powerful. The job of the coach is to be able to bring out the answers to their clients, which the clients themselves already know. It is within them. The coaches experience has nothing to do with the clients, neither will it serves in creating the client’s vision. 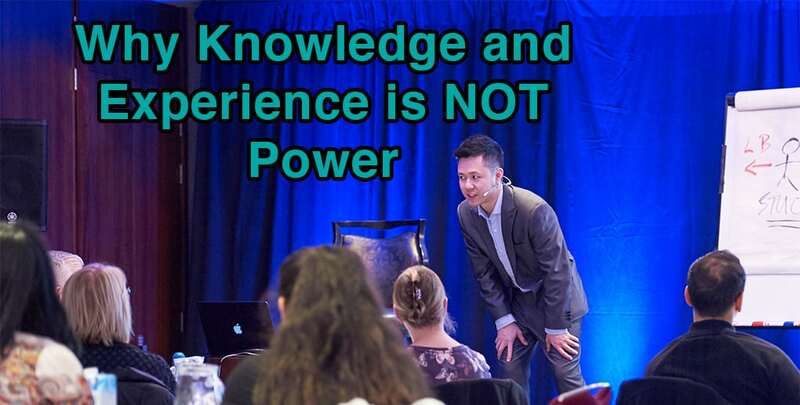 Experience is NOT power. It serves to keep you safe, survive and secure so that you don’t make the same mistakes twice. It does not serve your creative expression or allow you to connect dots that have not been connected before. 1) Your mind/ego, governed by beliefs, rationalisation and experience. 2) Your soul/heart, governed by creativity, vision, intuition and not needing to know. True power is knowing that everything in life was created by you alone and taking 100% responsibility for it, as you are the powerful creator of your own life. This is when you’re stepping into your Leadership. True power is the ability to engage your creative spirit and intuition, allowing you to innovate and create bridges that have never existed before. Creativity is Power. Intuition is Power. The truth is, experience engages the Ego and Innocence is the gateway to your heart and Intuition.